Your turtle’s diet will determine their long-term health and their longevity. Finding the best turtle food for a long-term diet is difficult at best. There are tons of commercial turtle food’s available, but there is also an entire community that encourages giving raw food to your pet. Which side is right? We’ve gathered a ton of information, and there is truth to both sides. We’re reviewing the turtle foods we could find, but there is also a raw food diet guide which is encouraged. However, if you have any questions about your turtle’s diet and its long-term effects, always consult with your veterinarian. How Do I Feed My Turtle? The downside of selecting a store-bought food for your turtle is that each one seems to fall into the category of staple or supplement. But, don’t you think if food is a staple, it shouldn’t need supplementing? Well, we thought so too, and unfortunately, it doesn’t work out that way for turtles. There is a delicate balance between store bought turtle food, raw diet, and of course, treats. Turtles are official “Adults” at 18 months so be sure to scale back the amount of protein you turtle is getting after this time. They are at risk of growing too quickly, pyramiding and other issues if their diet isn’t balanced correctly for their age. Most pellets don’t deliver a complete diet. Any vet will recommend that you rotate their raw food, pellets and treats to ensure they get everything they need. Unfortunately reading labels on turtle food isn’t the same as reading labels in the grocery store. Because no government entity regulates pet food, especially for reptiles and amphibians, the labels that claim, “complete diet” and “everything your turtle needs” can’t be trusted. It’s regular for turtle owners to provide pellets as the primary diet with a rotation of veggies, fruits, and treats. So which food is the best for your turtle? How can you tell? There are two ways to go about feeding your turtle. You can either feed them straight into the tank they live in, give them a separate feeding tank, or set aside an area of the tank for feeding. When your setup a section of the tank for feeding or give your turtles a feeding tank it makes cleaning their habitat much easier. Because their food waste is concentrated in one section, you can focus your energy where you know the waste is settling. Let’s be honest; turtles are messy eaters! If you have a baby or juvenile turtle that is growing rapidly and needs food often be sure to give them more protein than anything else. The easiest way to introduce protein that is always available when they’re hungry is crickets or mealworms. You can place either crickets or mealworms straight into their habitat but remember that they have their bodily waste. For mealworms, it’s recommended putting them in a food dish that your turtle can reach, but they can’t wiggle out of to escape. Crickets, however, will roam all over the tank. Finally, a special note on supplements. Many turtle owners use supplements to ensure their turtle gets a wide range of vitamins, minerals, and micronutrients. Some supplements are better than others, but the quality options quickly become expensive. While most turtles love eating raw food over pellets, what to feed them is questionable. Many turtle owners recognize that their pets love leafy greens and fruit. This combination of foods is not a balanced diet. Aquatic turtles can benefit from the same diet plan. Your family veterinarian can help you establish which raw foods are most beneficial for your turtle. Always consider adjusting or modifying a raw food diet for your turtle’s age, size, and of course their preferences. All turtle owners know they can be quite particular with their diet and some are downright picky. Keep in mind with crickets and mealworms that your turtle can’t take down anything larger than the space between their eyes. Always steam or boil vegetables and then let them cool before serving to your turtle. All these veggies are quite dense. Consider cutting your fruit into tiny pieces so they don’t try to take on more than they can get down. These are the foods that can cause long-term damage and prevent their ability to absorb necessary nutrients. Unfortunately, many turtles love these foods, especially broccoli, as a treat. If you are new to turtle ownership check out this list and modify your turtle’s diet as necessary. Turtles are wonderful pets, and they deserve treats from time to time. There are plenty of nutritious options they can have between meals for a pleasant snack. Dried shrimp, apple slices, melons, strawberries, and dandelions are common favorites. Although if they have them too often, your turtle might get a little chubby. Unfortunately, fat turtles are not as cute as fat cats. We’ve scoured the internet to evaluate the top 5 turtle pellets, supplements, and treats available. Purchasing pet food online or at your local pet store is much easier than working out a weekly meal plan for your shelled friend. Remember that each of these pellets may need supplements. Also, don’t fear treats, they aren’t the highest nutritional quality, but they do bring in nutrients and minerals that your turtle needs. How can a turtle food that sets in their water be waste-free? Because it takes so long to dissolve if you overestimate how much your turtle is eating they have time to eat it later before breaking down into the water. Many turtle owners are very happy with this product, and it is one worth considering. Unlike other turtle food, this product doesn’t come in tiny 1 or 2-ounce containers. Packaged in a 6.83-pound bucket, this is going to last you for a long time. The formula, which is our primary concern, is high in protein and calcium. It has a lot of other vitamins and minerals as well which is a plus. This combination of protein and calcium isn’t the most balanced diet but adding raw vegetables to their diet is a great way to achieve a well-rounded meal. The manufacturer and turtle owners who use Tetra 29258 Reptomin suggest that you use this product twice a day in small batches. The focus on protein is great, and we can nominate the Tetra 29258 Reptomin as the formula of choice for juvenile turtles. For adult turtles, it’s easy to scale back the amount of Tetra Reptomin and replace some of it with raw vegetables and leafy greens. The size of the container is a double-edged sword for many new turtle owners. If they end up not liking the product, you are stuck with literal pounds of unwanted turtle food. Usually, if turtles turn up their nose at something initially, they’ll come around and try it after it’s in their tank consistently. So, don’t give up if your turtle doesn’t like Tetra’s Reptomin immediately. Clean the turtle tank and keep trying for a week or two. This is a great base for a well-rounded diet. You can always add in crickets for more protein if you have a juvenile turtle, or leafy greens if your turtle is an adult. The price is very affordable considering you don’t need to buy a new bucket every month. This bucket will last a very long time. Fluker’s is a well-loved brand among aquarium and turtle enthusiasts alike. It’s trusted, and many people say that the claims of high protein are completely reasonable. Frequent users also note that it is easy to clean and doesn’t tend to cloud the water after it’s dissolved. 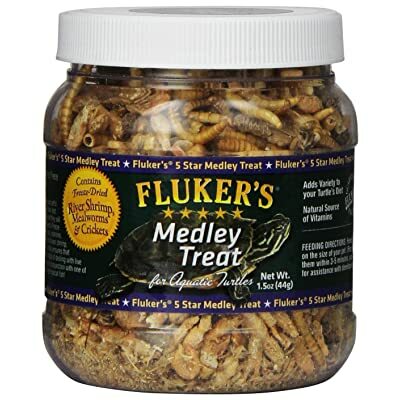 This treat is one of the top-rated products for turtle treats, and it deserves it! The combination of freeze-dried mealworms, river shrimp, and crickets are a lot of protein. A great feature for juvenile turtles. But, this is way too much protein for adult turtles. However, for adult turtles, it does make a wonderful treat. Using this from time to time is reason enough to keep a small jar around. It’s also reasonably priced for its ingredients. Typically, this blend of mealworms, shrimp, and crickets is more expensive. We don’t like the fact that its only protein. Because the only ingredients are river shrimp, crickets, and mealworm it’s easy to overfeed your turtle. Then they’re getting zero vegetables because they’re full. As the name suggests, this is a treat more than the basis of a balanced diet. Again, if you have a juvenile turtle, they can do with a bit more protein, but this still shouldn’t be available at every feeding. Working this into diets is easy because most turtles love shrimp and crickets. However, you turtle can quickly come to expect this treat all the time if you’re not careful. It’s important to closely monitor how much of the Fluker’s Medley Treat you give your pets. Zoo Med has a long history of designing food for reptiles and amphibians, which is a plus when it comes down to selecting a turtle food. A well-trusted brand usually uses better ingredients and maintains a higher level of quality. This increased focus on quality is to retain as many customers as possible, and this strategy works! Together these provide a diet very similar to what they would encounter in the wild. These ingredients also stimulate your turtle, which many turtle owners struggle with because turtles easily become lazy. But, lazy turtles are different from slow turtles, and this food will help keep their activity levels up throughout the day. The downside is that since Zoo Med is such a great option for a standard feeding, it’s expensive. You will quickly go through the 4.5-ounce container and since it’s about 10 dollars a jar that price will quickly hit your pet’s budget. If you can afford the Zoo Med it’s worth it. It is one of the most well-balanced turtle foods available. Fluker’s comes to this list again with another, more affordable option, that is aided with added vitamins and nutrients. 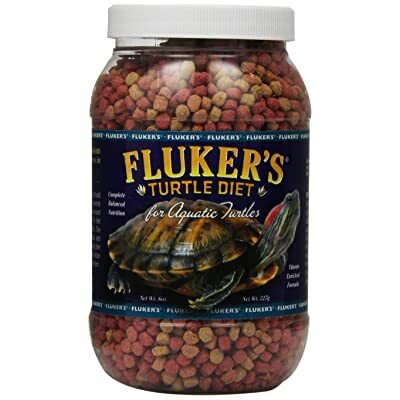 Although Fluker’s is usually transparent with their ingredients, the only clear indication here is “essential ingredients” although Fluker’s assures their users that this formula will leave nourish your turtle. There are a few things about this product that stand out as clear positives. First, the pellets float, which makes it so much easier to clean afterward. Secondly, it’s affordable, and that can make a huge difference for some pet owners. Finally, it already has added vitamins and nutrients. The presence of additional vitamins and nutrients means you don’t have to worry about supplemental powders or pellets. The concern with phrases such as “essential ingredients” and “high-protein blend” is that they aren’t advertising what ingredients are present. Again, because there’s no one regulating the ingredients used in pet food it concerns when the company doesn’t disclose what is used. This food choice is probably a reasonable option for young turtles. Taking Fluker’s on their word that the pellets are high-protein, it is viable that juvenile turtles would benefit. There is also the presence of added vitamins and minerals which means this is a great alternative to supplements. This product is another treat that works as a supplement. 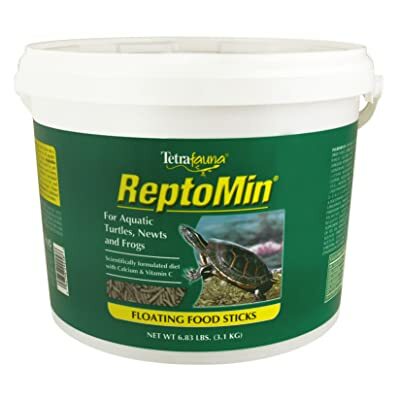 Many aquatic turtle owners suggest using Tetra’s TetraFuana ReptoTreat as a supplement to the Reptisticks. This treat can help stimulate appetite but be careful because your turtle will probably enjoy this treat more than their actual food. We like that Tetra is again transparent with the ingredients and specifies that this is only a treat. The other benefit found here is that the packaging keeps the treats fresh. By using such small envelopes, you can rotate through different treats without these one’s going stale. We don’t like the price tag on this product, especially when combined how much turtles love the treat. Many turtle owners note their turtles held out expecting more treats than food. 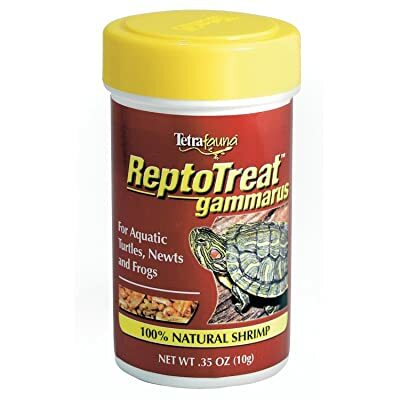 Tetra’s TetraFuana ReptoTreat is a great treat that is very high in protein. Avoid if your turtle already has a high protein diet. But, if your turtle eats mostly vegetables, this is a great treat that can help stimulate their appetite. Zoo Med, the well-loved and trusted brand wins the spot for best turtle food available. 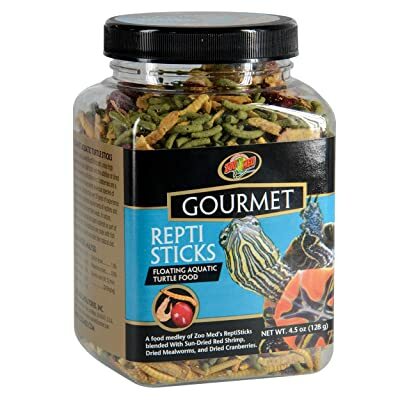 The Zoo Med Reptisticks are designed specifically for the nutritional needs of aquatic turtles. Unless you have an exotic species, the odds are that this food will provide most of the nutrients your turtle needs. Because turtles love to eat constantly, it is important with the Zoo Med Reptisticks to only give your turtle what they need. It does cloud the water and breaks down quickly. However, if you’re nervous about giving them too much you can feed them twice a day or more if they are still hungry. Zoo Med delivers the blend of animal and plant ingredients. They use ingredients that stimulate activity and simulate a natural diet, which put them in the top spot.